Students will love coloring these color by code clip art graphics so much they might forget they’re learning! Simply fill in each blank space with numbers, math facts, words, parts of speech, or anything else you can think of. Create a key for your students to follow and they will enjoy coloring while reinforcing content you taught in class! In addition to a blank black and white version for students to color, a colored example is provided that can be used as a key. The set includes a total of 10 template images (5 Color and 5 B&W). These are pre-made images that will make your life easier when creating your own Color By Codes activities which as: Color By Numbers, Color By Word, Color By Symbol, Color By Icon, etc. The images are high resolution (300 DPI) which means high quality printing. Files are provided in only JPG format. For personal or commercial use. 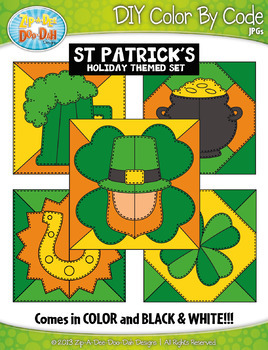 PLEASE NOTE: This set is included in the Holiday Quilt Color By Code Clipart Mega Bundle Pack. Please don't purchase this set if you have already purchased the Mega Bundle Pack because you already own this set!